We all love a trip to the movies, but for many and outing to see a movie with the family can take a big chunk out of the family budget. So here are 16 ways to save money on your next trip to the cinema in Perth! 1. If you have a Kidzabuzz Family Voucher App, there are vouchers to save you money on kids movie tickets, family passes and candy bar purchases as well as lots of other vouchers to save you money on Perth's & WA's family attractions, cafes, accommodation, shopping etc. 2. Are you an Optus customer? Optus customers can get movie vouchers from $9 for kids for Hoyts Cinemas with Optus Perks. You need to go to Optus Perks and select book now and you'll be directed to the Hoyts website to book your movie session. 3. 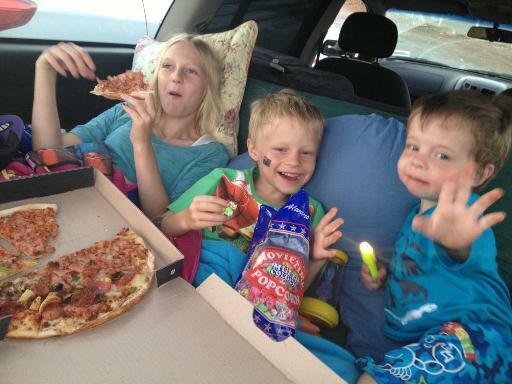 See a movie at the Galaxy Drive-Ins Kingsley. On the weekends they screen two movies and one movie during the week. Adults enter for $10 and kids for $5 ($9 adults & $4 kids during the week). Kids under 4 enter free. You can bring your own food and drink or get something from the reasonably priced candy bar. Also, Tuesday nights are only $20 per car! 4. Find out about memberships at your local cinema. Some offer discounted movies if you purchase a membership, or free movies after a certain number of paid movies. Hoyts Rewards has two membership options. The free Hoyts Bronze Membership give you access to a discounted movie each week, pre-sale access on select block busters and candy bar promotions. The Hoyts Silver Membership is $13p.a gives you Hoyts dollars when you spend, a free movie ticket on activation, discounted movie each week and more. Cinebuzz Rewards with Event Cinemas rewards you with "See 6 Movies Get One Free". You also get exclusive perks including discounted movie tickets for selected advanced screenings and other special events. 6. Head to United Cinema Rockingham - all tickets are only $9 ($8 for seniors & upgrade to recliner cinema $18). Reading Cinemas have tickets from $10. 7. RAC Members get discounted movie tickets at several cinemas around Perth, including Hoyts, Event & Movie Masters Cinemas. E-tickets and mail out available. 11. Event Cinemas in Morley and Innaloo often run Weekend Family Flicks - tickets are just $6 each. Weekend Family are usually published at the beginning of the new school term. 12. For parents, catch a movie during the week and take the kids along to a Bubs Club or Bring Your Baby session. Tickets are often discounted. Bring Your Baby Sessions are at Event Cinemas, Bubs Club at Grand Cinemas and Ace Cinemas Bubs Club. Check your local cinema to find out what they offer. 13. Are you a Telstra customer? Well you can get movie tickets from $12.50 as well as vouchers for candy bar upgrades, with Telstra Thanks. You can use the Telstra 24/7 app to book and pay for your tickets, as well as get a e-ticket to your inbox to present at the box office. 14. Catch an outdoor movie! During the Spring & Summer there are lots of free and cheap outdoor movie screenings. You can also find vouchers in your Kidzabuzz Family Voucher Book, for family passes and discounted tickets for Community Cinemas. Also see our list of Outdoor Cinemas for movies showing near you this Spring/Summer season. 16. Save up to 45% OFF tickets for Ace Cinema, Event Cinemas, Grand Cinemas, Hoyts Cinemas. Luna Palace, Moonlight Cinemas & Community Cinemas with Alinta Positivenergy Rewards. You'll need an account with Alinta to access these and many other rewards.